If I said “Slugs and snails”, what is the first thing that comes to mind? Do you think of a slug as a pest which the world would be a better place without? I certainly do, when I think of my new lettuce seedlings and tender sweet peas recently decimated by slugs and snails. I was reading an article this week in the ‘i’ newspaper, in which Chris Packham (the BBC Springwatch presenter) gave a different view point, which I thought I would share with you. He thinks you should “Think like a slug”. As well as growing plants, I also have a passion for hedgehogs and think that our use of slug pellets should be reduced. 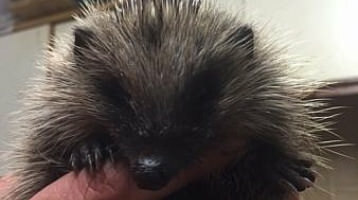 Whatever the pesticide companies say, it cannot be good for any animal to ingest chemicals on a regular basis which is what is happening when a hedgehog eats a contaminated slug. I believe that metaldehyde, the active ingredient of many slug pellets is systemic and that there have been incidences of dead hedgehogs with very high levels of this in their bodies. I’m sure someone will prove the connection, but for now common sense says that large quantities of slugs that have consumed slug pellets cannot be good for hedgehogs, thrushes or slowworms. As a gardener, I have an inherently negative response to slugs but there is actually more wisdom in Chris’s point “Think like a slug“ (once you’ve got over the response of ‘Yuck’). He goes on to illustrate his point with a great analogy. If Waitrose were to tell you that everything was free, you’d rush to fill up your basket, wouldn’t you? Well, the slug is doing exactly the same thing when you plant lots of tender, tasty seedlings. So firstly, stop lining up the temptations in easy to reach rows and expecting the slugs not to go for them. Secondly, although you could still be tempted to reach for the slug pellets, read on and find out about the two alternative slug deterrent activities I undertook this year. Initially I did not intend to go on a slug-pellet-free crusade. We were going through a very dry spring and I wanted to cut down on the amount of watering. I thought the soil on the allotment required sustenance anyway so thought I would apply a mulch. Applying a mulch, as I’m sure you know, cuts down on the amount of moisture that is lost from the soil surface which means that when water is scarce, this preserves the little there is within the soil profile. I decided to use a relatively new mulch product on the market, called Strulch (www.strulch.co.uk). It is made from chopped up straw that has been mineralised to make the decomposition of the straw a consistent process over the natural fluctuating one if left untreated. It also gives it a brown colour which looks more appealing on the beds. It also has the added benefit of being a deterrent to slugs and snails – bingo! – two problems solved with one product! Sounds too good to be true but it has worked well so far. The slugs, being determined souls, made determined efforts to get to the seedlings but on the beds where I have applied the Strulch thickly and widely, only the most persistent got anywhere near the precious plant. The soil underneath was also nice and moist so my twin goals of not using slug pellets and cutting down on the amount of watering I needed to do, have been achieved. The other thing that I did was that once my seedlings had germinated, I transplanted them in to small pots and let them grow quite large before planting them out on the allotment. I have to ‘fess up and admit that this came about by default but it had the added advantage of giving the plant a well established root system and that it now has leaves beyond the reach of most slugs and snails. This meant that the plant could withstand the loss of a few leaves at its base.